The last two weeks of January show some continuing lower-than-expected sales figures, as a likely effect of holiday fatigue. Both of these weeks saw formula-based estimates wrong* in an abnormally large number of cases. in each week, 7 out of 26 releases were overestimated, while none were underestimated. 5 of these in each week were repeat offenders; The Cat Returns [BD], Kaguya [DVD], Naruto The Last [BD+DVD], and DBZ:F [DVD]. Cat and Naruto have been under-performing their ranks basically from the outset, leading me to believe that they had a more narrowly targeted releases. 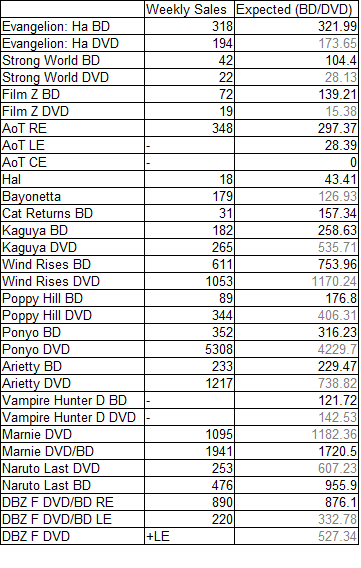 Similarly, I suspect the new underestimation happening with the DBZ:F DVD editions is due to demand concentrating around the regular BD/DVD edition. 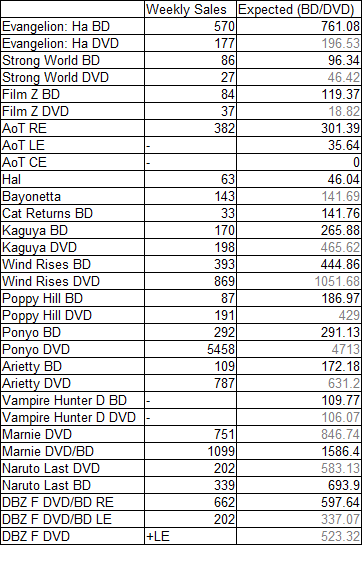 Meanwhile on mainstream Ghibli releases, Arietty’s estimates, formerly way under, are no longer off, and Kaguya on DVD is flagging relative to where it should be. 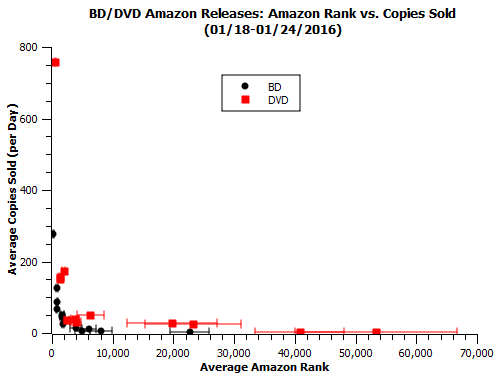 To date, there does not seem to be a consistent range of amazon ranks where these over/under estimates happen for different releases. 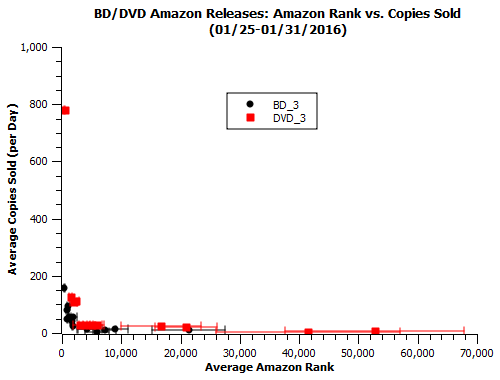 I don’t think it’s fundamentally the ranges of amazon ranks which cause this to happen, but rather patterns in sales outside amazon. *Meaning, in this case, off by a factor of 2 or more. -Sales in general are also kind of down this period. We see more series typically in the low-thousands in the mid-thousands, and quite a few averaging above the basically-nothing 40k threshold. Probably fatigue from the holidays. -Marnie’s oscar nomination bump is sort of tough to analyze over these two weeks, as the numbers are staying fairly steady, but it’s questionable how quickly a decline would have happened otherwise. Next week, hopefully, we’ll see the performance of the third Evangelion rebuild in its first week, where it managed to rank top-20 overall for several days. That’s the kind of works that we need as manga fans.